For many of us it still continues to be known as “the sacrament of confession, since the disclosure or confession of sins to a priest is an essential element of this sacrament” (1424). At the same time, the Catechism reminds us that “it is called the sacrament of forgiveness, since by the priest’s sacramental absolution God grants the penitent ‘pardon and peace'” (1424). Finally, it is also called the sacrament of Reconciliation because it reconciles sinners to God and then to each other (1424). Through this sacrament, we meet Christ in his Church ready and eager to absolve and restore us to new life. The graces of Christ are conferred in the sacraments by means of visible signs – signs that are acts of worship, symbols of the grace given and recognizable gestures through which the Lord bestows his gifts. 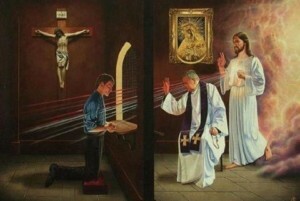 In the sacrament of Penance, the forgiveness of sins and the restoration of grace are the gifts received through the outward sign, i.e., the extension of hands and words of absolution pronounced by the priest. The priest continues: “Give thanks to the Lord, for he is good.” The penitent responds: “His mercy endures forever.” The priest then dismisses the penitent, using one of the formulas found in the ritual. The Sacrament of Reconciliation is available here at the Shrine of Our Lady of Guadalupe every evening beginning at 6:00 p.m. The Sacrament is also available on Sunday between masses. Lastly, you may also set up an appointment with one of our priests by calling the Shrine office at 847-294-1806.